It might be June and I am still finding the odd game and new ground to go to. I knew I could always rely on Scotland for a match. Today entailed a trip on the train to Dundee as Broughty Athletic play on the outskirts of the City for the Scottish Junior East Region Super league game. 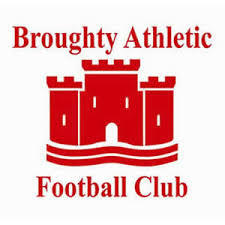 The club was originally formed in 1920 as Broughty ex-service men and the club was not renamed to Athletic until 1951. It seems the club is part of the Dundee East Community Sports club project which includes 5 football clubs, a rugby club, Cricket club, tennis club, table tennis, bowling, handball and karate. The community project has ambitions to further develop facilities in the future. The Whitton Park club is named after a former player. This ground is as probably basic as it gets for the ground hopping connoisseur. There was no programme, no floodlights, no covered accommodation for standing spectators and no terracing. I could go as far as to say there were no seats but there were about three or four park bench wooden (unbacked) seats around the grassed slopes of the ground. There were two concrete buildings, which were windowless, for the changing rooms, manager’s office and I think a small bar area. Behind the goal there were a few shipping containers (easy to get as the area was in fact called Broughty ferry), which were probably used as storage for any machinery for the pitch. Talking about the pitch it was in really good condition considering this was and end of season game. But as basic as the ground sounds I would rather be here today than sitting at home watching the Champions league final between Juventus and Real Madrid. I always have great admiration for the work the committee, fans, volunteers and players for their efforts they put in at this level of football. Today’s opponents for Athletic were Lochee United whom I saw play just two weeks ago at Hill of Beath. The game kicked off and the sun was shining. That was soon to change in the game as the rain came down in typical British summer weather. I thought the home side had slightly more of the play early on but the visitors came more and more into the match. They took the lead with a headed goal on 23 minutes and doubled their score 5 minutes later. Another goal 4 minutes later and the visitors were 3-0 ahead and you would thought it was game over by then. Broughty were not to be outdone and they pulled a goal back on the stroke of half time. Lochee United is a local derby and there seemed more of their fans than home fans judging by the cheers that went up when goals were scored. It was a really healthy end of season crowd there was as well with about 200 at the game in my estimation. That goal just before half time gave the home side a little hope that all was not lost. The half time managers ‘pep talk’ did wonders as Broughty played much better in the second half. With just 8 minutes left on the clock and Broughty scored a second goal. The finale was set up for a cracking equaliser after being three nil down. I thought it was to be when Broughty had a tremendous effort on goal to see the Lochee Utd keeper just turn the ball around the post to save the day. That was the final score as Broughty had nearly done it and saved a point. It was not to be. I enjoyed the game despite paying £75 on a train ticket to Dundee. As I say there was no Champions league football for me when I got home that evening. It’s June and I have finally watched my last league game of the season. It is only a few weeks before the friendly fixtures start and another season is about to get underway. Amazing how it all comes around so quickly!